Kashmir and Ladakh | Travel Smart! Kashmir and Ladakh are two mountainous regions in the state of Jammu and Kashmir (J&K), under the Indian control. Ladakh is in the eastern part of the state, and Kashmir is in the western part. The geography of those areas is a complex continuum of mountains and valleys in the Himalayas. But a closer look at the political map will make you quickly realize that we are talking here about a disputed area, where the borders are not always obviously drawn on the maps. It is surprising to notice that the Indian version and the .com version of Google Maps are not identical, and none of them can tell you where does the territory of India stop and where do Pakistan and China start. On the .com version here above, the dashed lines surrounding the state of Jammu and Kashmir (J&K) do not indicate what is under the control of whom. Whereas on the Indian (.co.in) version above, the state of Jammu and Kashmir is shown bordered by a continued line which include parts that are actually controlled by the Chinese and the Pakistani governments. Official touristic maps published by the J&K Tourism do also include into the J&K state territories that are obviously under the control of the Pakistani government in the north and the Chinese government in the east. It says a lot about the deepness of this geopolitical conflict. Even if India has agreements with its neighbors about ceasefire lines, those are rarely to be found on maps. The situation on the ground is quite different from the confusion we can experience from the maps; there is a Line of Control (LoC) separating Pakistani controlled territories from Indian controlled territories, and a Line of Actual Control (LAC) separating Chinese controlled territories from Indian controlled territories. The region is one of the most militarized areas in the world, and this map below shows the actual facts on the ground. It was published by the CIA and available on the Web site of the Library of Congress. Jammu and Kashmir map published by the CIA in 2003. It is mainly the orange region on the map here above that you can visit as a tourist in India or even as an Indian citizen, and that’s not without ID controls and some permits for specific areas. If you follow the Line of Control at the north east of Kargil, you will notice that this line stops where the Siachen Glacier starts. During a trek in the mountains of Ladakh, we met a Ladakhi man who is a military in service on the Siachen glacier. The glacier is one of the biggest in the world, if not the biggest outside of the polar areas. It is also the highest battle ground on earth as the glacier is mainly now under Indian control and still disputed with Pakistan. Both countries maintain permanent troops on the Siachen glacier at altitudes above 6000 m! How to travel to Kashmir and Ladakh? There are two main airports: at Srinagar, the summer capital of J&K, and at Leh, the capital of Ladakh. The roads leading to both capitals are pretty good, even if the journey can be long. The road leading to Srinagar goes through Jammu, the winter capital of J&K. And there are two main roads leading to Leh, one from Srinagar through Kargil, and the other one from Manali. If you are not already acclimatized to high altitudes, it is not a good idea to fly directly to Leh, as you may experience some problems related to altitude sickness. The best way is to take the road from Srinagar or Manali. Then it can be very useful to fly back from Leh. To visit Kashmir and Ladakh, and because of the difference of altitude between those two areas, it is obviously better to start with Kashmir (if you are not already around Manali), have some treks in the Kashmiri mountains, then go to the higher mountains of Ladakh. It is very easy to find shared Jeeps that make the road daily. From Srinagar to Leh, it is good to make a stop at Kargil (2676m), as this will help you to acclimatize. Even if Kashmir is nowadays mainly Sunni Muslim, it lived under the influence of several other cultures and religions especially Hinduism and Buddhism. Srinagar is mainly inhabited by Sunni Muslims, and it has also smaller communities of other religions or traditions like Shia and Sufi Muslims, Hindus ans Sikhs. Ladakh has much more Buddhism, but is also home for Shias, Sufis and Sunnis. The geography of the area is made of natural barriers of high mountains separating groups of people from another. With many peaks above 6000 and 7000 m, Kashmir is very different from Ladakh from all the points of views, including the fauna and the flora. This resulted in the emergence of different languages within the whole area. In Srinagar the main language is Kashmiri. In Ladakh it is Ladakhi. In other valleys of the high land of Ladakh some villages speak Balti, a langauge also spoken in the mountainous region of Baltistan in the actual Pakistan. 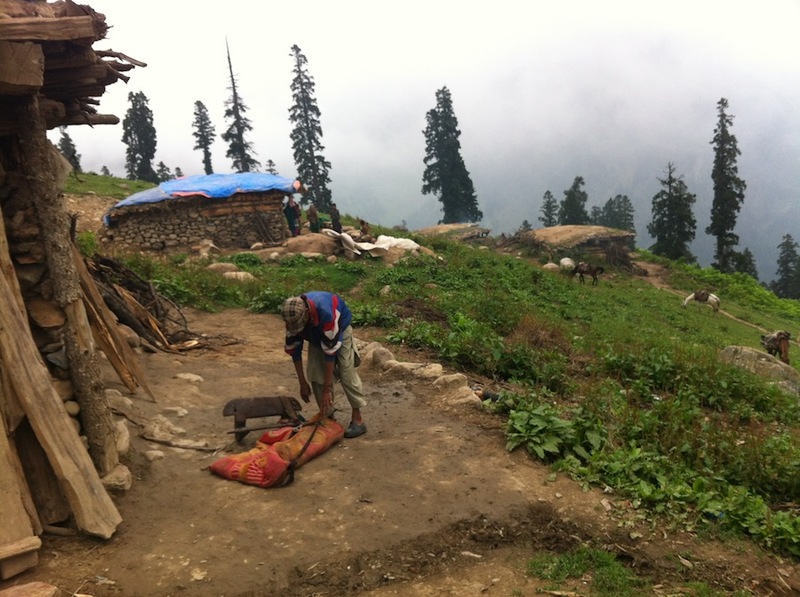 In Kashmir, once you go outside of Srinagar, you will meet the Kashmiri gypsies who speak the Gojri language. Kashmir and Ladakh have their own historical kingdoms, languages, religions and traditions. The food is different, the climate is different and the landscape of the mountains is totally different. When we talk about the Indian controlled Kashmir we mainly talk about the Kashmir Valley where is located the summer capital Srinagar. Surrounded by high snow-covered mountains, the valley is surprisingly flat and big: 135 km long and 32 km wide. In Srinagar you may probably want to stay in one of the house boats on the second largest lake of the valley, Dal lake. From there, it is the ideal departure point to go and explore the villages in the mountains around, and trek to wonderful high altitude lakes surrounded by glaciers and mountains. Contact my best Kashmiri friend Niyaz Khar. He will provide you with accommodation on a house boat or on the mainland with a very good price and service. He is the owner of a hotel himself, and his family owns many house boats. If you prefer to walk directly to a trustworthy place, we recommend the Nath Guest House (here on the map). Then ask for our friend Suhail (Facebook or +91 70060-78725). Suhail has a very nice small hotel with a beautiful view on the lake. The rooms are clean and nice, and the price is very good. 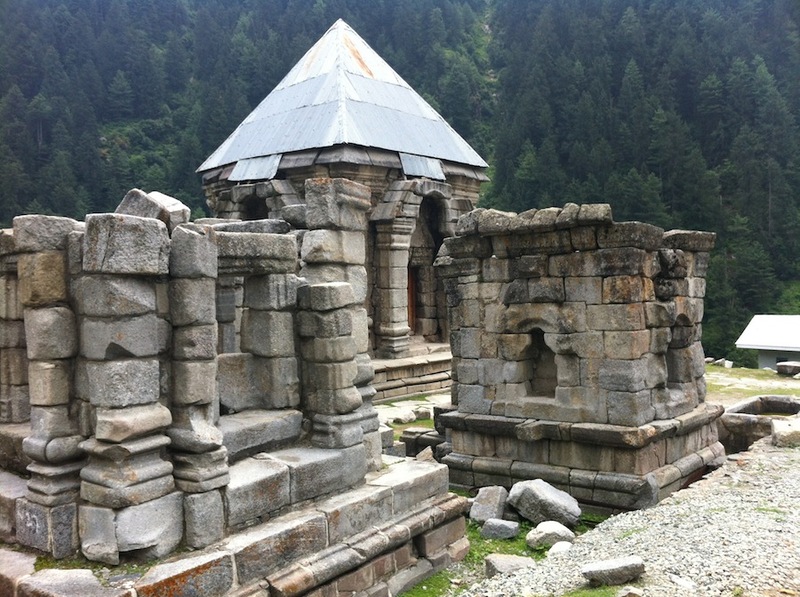 We will recommend here two places to go and visit in Kashmir. An easily accessible village by road called Aru, and a trek from Naranag to a large high altitude lake, Gangbal lake. To locate the small village of Aru on the map, zoom in on Srinagar, then go east until Pahalgam. Aru is around half an hour drive north of Pahalgam. The best way to go there is to take a shared Jeep from Srinagar to Pahalgam, and then another from Pahalgam to Aru. There is also a bus from Srinagar, but it is much slower. We recommend you to stay at the Snow Mount Hotel in Aru, as it is a very good value for a very cheap price. You can easily find it by asking anybody there. Snow Mount Hotel Facebook page. Expect to pay around 300-500 INR in low season. We also did a short documentary about Aru, showing the landscape and giving some tips about where to go and what to do. To locate the Gangbal lake (3575 m) on the map, you have to zoom in into Srinagar and then go north until you hit the road towards Kargil and Leh; there you are half way. 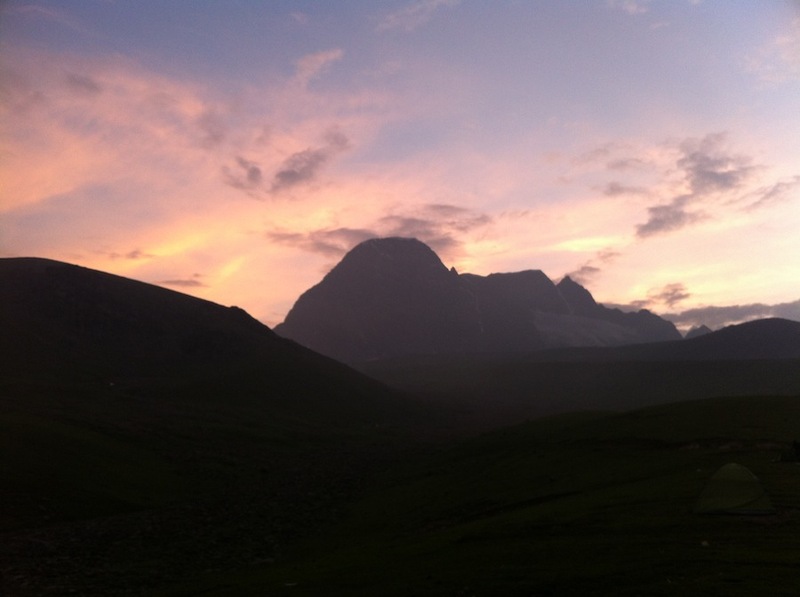 Continue another half to the north and you will see a mountain peak called Harmukh (5142 m). Zoom in into Harmukh, and you will see at least seven lakes around. The biggest lake is Gangbal lake. 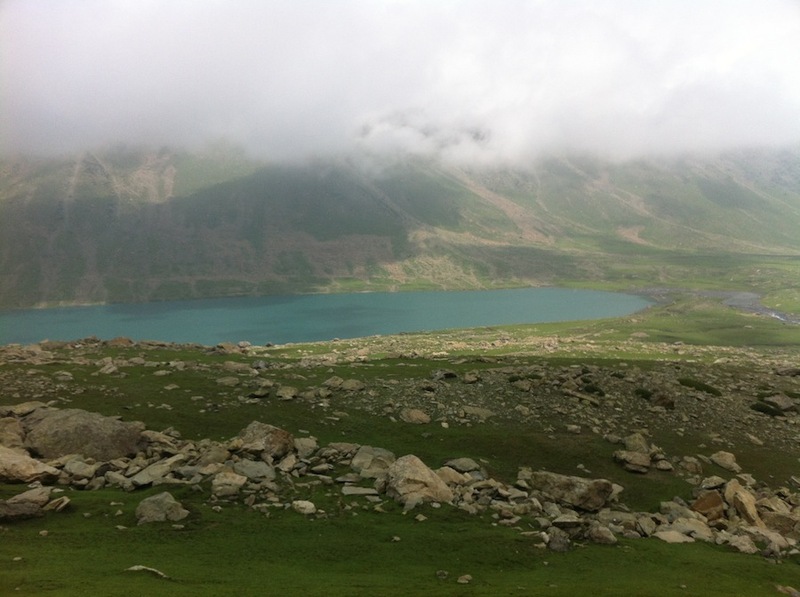 During a trek to Gangbal lake, you can continue and see other wonderful high altitude and isolated lakes. Naranag is a village south east of Harmukh and it’s the departure point of this trek. There are no places to stay after Naranag. This trek involves carrying a tent, food, sleeping bags, etc. The usual and the best way is to hire a horseman. The land of Ladakh is generally higher than Kashmir, and the climate is arid. It is very useful to spend at least two days in Leh to make sure you are well acclimatized to high altitudes before engaging into visiting other places. 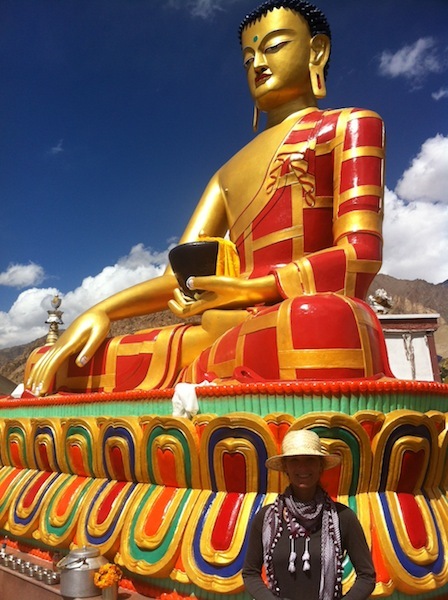 He is in Leh during high season, until October. He has a shop of precious stones and through him you can get better prices to rent bikes, or to organize treks or anything you need to move around Ladakh. In Leh, we recommend Rai-wa Guest House at Upper Changspa. It is very easy to find the guest house by yourself. First you have to ask for directions to get to Upper Changspa (by walking). Then, you can ask for Rai-wa Guest house. The guest house is run by a Ladakhi family. They have hot water and WiFi, and delicious apple and apricot trees. The place is spacious, clean and very quiet. Expect to pay around 500-600 INR in low season. A 3-day baby trek starting from Likir. 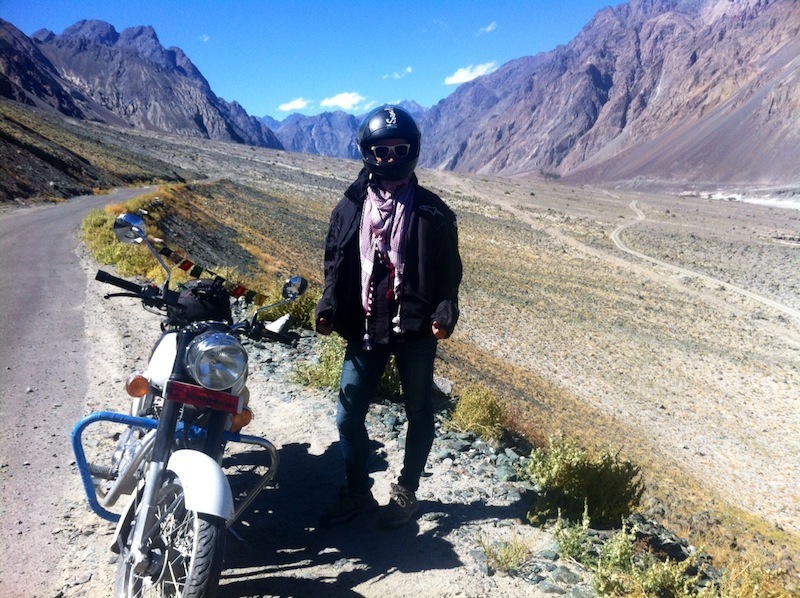 A visit to Nubra Valley following the road to Diskit and then until Turtuk. You can locate those places on the map below. It is also recommended to visit the huge Pangong Lake (134 km long) located at an elevation of 4250 m and which extends from India to China. 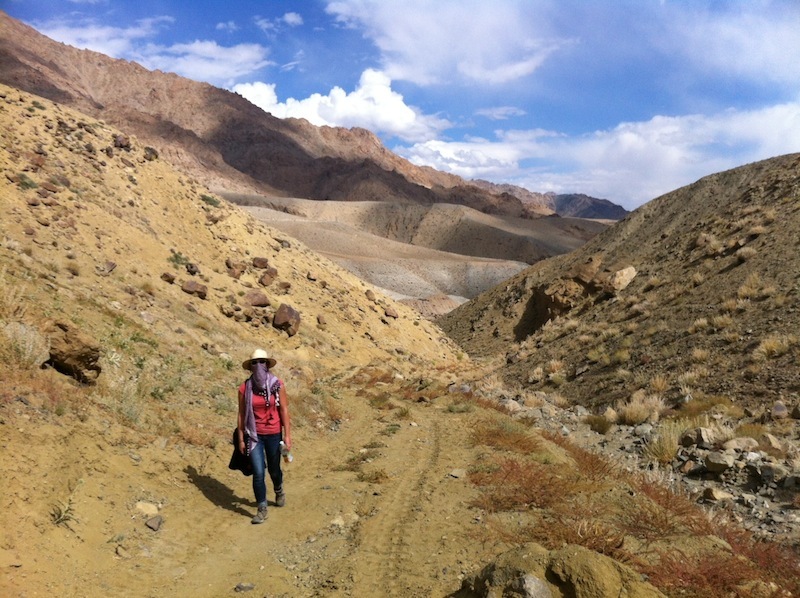 This is a perfect easy way to start exploring the desertic mountains of Ladakh. The trek is easy and cheap. No permit is needed. No tents, no sleeping bags. If you are a motorbike fan, this is probably the most memorable bike trip you can experience. The road from Leh to Diskit is famous for going through the Khardung La pass, the highest motorable road in the world, 5600 m above sea level, with a breathtaking view. Otherwise, you can also opt for a private or a shared Jeep. P.S. : A special permit is required to access Nubra Valley. You have to plan at least two nights to go until Turtuk and come back, and ideally more. Turtuk is wonderful Shia village close to the Pakistani border. Another exceptional place to visit and ideally to spend a night at is Hunder (map). It is a bit after Diskit on the way towards Turtuk. The area is famous for its sand dunes and camel safaris with a view on white peaks. It is a desert above 3000 m of elevation. In September 2017, we hired two 350 cc Royal Enfield bikes and we drove til Turtuk. We are preparing a detailed map and video about this adventure. We will put the link here. We met Niyaz for the first time in Delhi in 2015. We stayed in contact until we saw him again in 2017. We lived with him and his family in Srinagar, Kashmir for 3 months. As we became almost part of the family, we knew that the father as well as the grand father of Niyaz were major tourist actors and house boat owners. Niyaz, with his two brothers, grew up on the Dal lake in the heart of the tourism activity in Kashmir. He counts many years of experience in organizing tours and treks in Kashmir, Ladakh and many other places around India. He is the best contact you can rely on if you plan to visit Kashmir and Ladakh. The name of his hotel is Sidsons Royale – Facebook Page here. I knew Shabir in Srinagar as he is the brother of Niyaz; this means that I also lived with him for 3 months and ate rice with him every evening. For many years, Shabir is the owner of a travel agency in Srinagar. He is your best contact to organize a tour in Kashmir and Ladakh for small or larger groups, from the airport until the way back home. Sidiq Tours & Travels website: www.sidiqtourstravels.com. Mention that you have been referred by Travel Smart! or Nadim. I trust those people with my life. The best time to visit Kashmir and Ladakh is during the rain season in the rest of India, from May to October. July and August are very busy, the temperature is higher and the prices of hotels may also be more expensive. Winters are cold in Kashmir and very cold in Ladakh. You can easily get a decent hotel room and 3 meals a day for a total of 2000 INR per day (around 30 US$) and even less. But a luxury hotel room can also cost more than 6000 INR per night. Going on treks or staying in the mountains does not cost more than staying in the city. Renting a Classic 350 cc Royal Enfield motorbike costs around 1400 INR per day (around 22 US$). Kashmir and Ladakh are generally very affordable destinations. When we traveled to Ladakh, we heard some people saying that Kashmir may be unsafe for tourists. Thinking that Kashmir is unsafe for travelers is a sign of ignoring the reality of the destination. Even if the Kashmir conflict is still going on, the war between India and Pakistan is obviously over. The conflict became mainly an inner Indian-Kashmiri problem. Even if some incidents occur here and there from time to time, they are always spread in rural areas mainly in the south of the Kashmir Valley. Places where you would stay in Srinagar or in the mountains are peaceful, safe and welcoming. Sidiq Tours and Travel: www.sidiqtourstravels.com. Indian Visa information and e-Visa: www.indianvisaonline.gov.in. Facebook group for precise information about trekking: The Himalayan Club. Contact us for any other information or group travel.